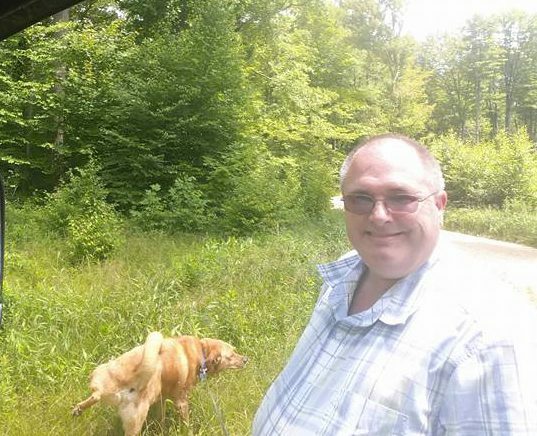 Jim, Chewie, and I arrived at our campground in Pennsylvania Saturday afternoon, and we were up and ready to explore fairly early Sunday morning. 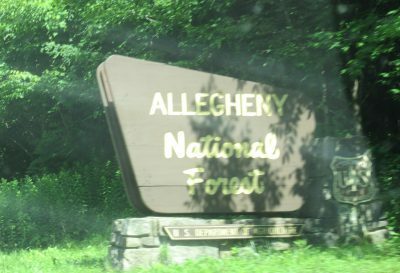 Jim suggested we make the day about exploring the Allegheny National Forest since it was such a beautiful day. We were dressed and loaded in the truck and ready to roll fairly quickly, but we didn’t have much to pack for a picnic lunch since we also needed (and planned) to go to a store later on Sunday. We had battling GPS information: The RV specific Garmin wanted to take us one way, and Maps on my phone wanted to take us another. We tried to follow Maps as it indicated we would be out in the rural area of the state, and it seemed to be a shorter route. 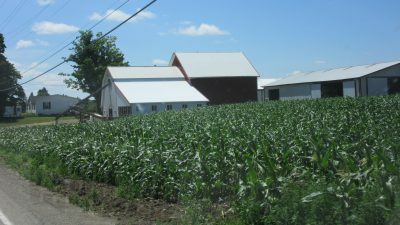 We saw lovely PA farms. 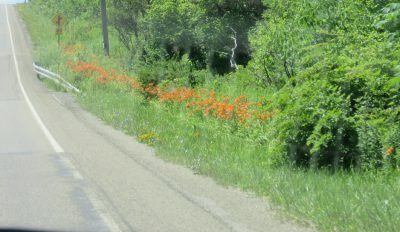 Beautiful lilies were everywhere along side the roads. At a certain point, we thought the GPS in the truck was on track with Maps, and we began to follow it. Nope! It was taking us back to the route it wanted us to take (and probably should have in retrospect). 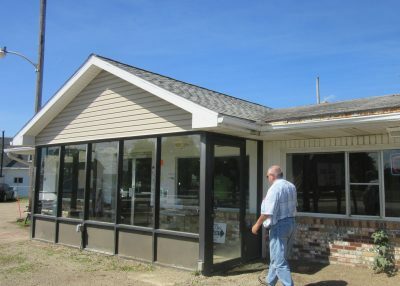 That was okay because we realized it was about lunch time, and we had reached a spot where there was a restaurant out in the middle of nowhere. Jim and I stopped to eat. It was a busy cook-to-order with good food; we could not eat it all. That fueled us for most of the day (but not long enough). We drove and re-routed and drove and re-routed again. Some of that was our fault, and some of it was Maps changing its mind. We enjoyed the beauty, but we naively expected some signage in a National Forest, but in the section in which we were, there was nothing really. 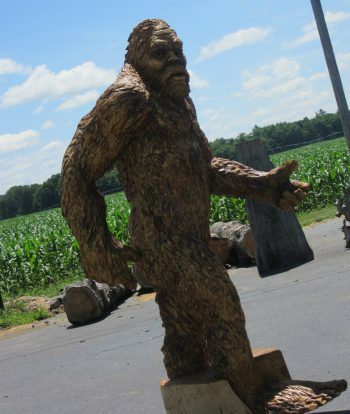 We had one Bigfoot sighting. After Maps took us miles down a narrow, gravel road, we finally found a clearing to turn around. Chewie had to pee, so he now owns it. 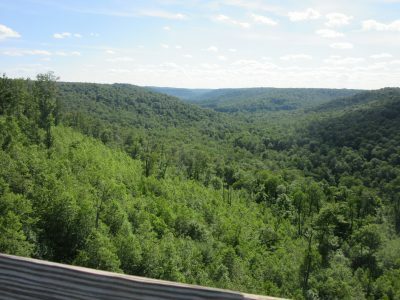 What I didn’t know until mid afternoon was that Jim had read about the Kinzua Skywalk, and he wanted to go there. Once I knew what he wanted to see, I tried to locate directions as we could get a bit of cell signal. Following those directions, a park area below the dam (and bathrooms) were located, but after passing the Dam, we lost ALL cell signal. The rare National Forest sign, more elusive than Bigfoot. As it turns out, the Skywalk is in a State Park, and we turned to the right when we should have gone left hours before. There was no sign until AFTER the left turn, so …… yeah……no real, helpful signage. After hours of searching, we finally made it to the Skywalk. 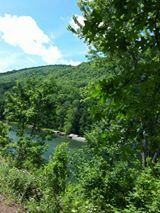 It took us so long to locate the Kinzua Skywalk, that by the time we did, Jim’s blood sugar had dropped. He was not able to walk out on it or even drive until we could find him some food. 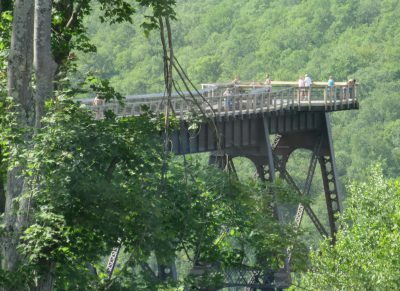 The Kinzua Skywalk uses two remaining rail towers from a train rail built over the gorge to make this walk to a breathtaking view. From pictures I’ve seen, it is probably the most beautiful in fall. Jim got food at the first town we could find, and then he slept. 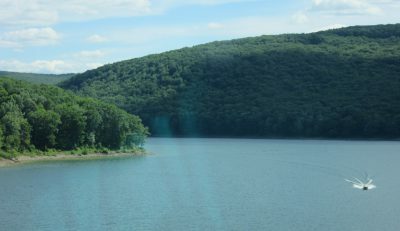 I followed the truck’s Garmin GPS back to the campground, and the views were simply amazing; I hate he slept through it. 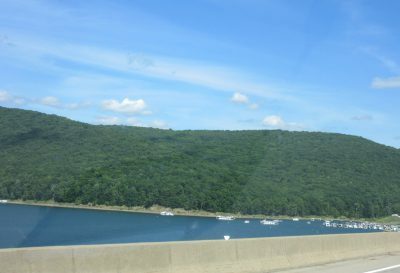 The Allegheny River Valley is beautiful, but I could not make pictures since I was driving. 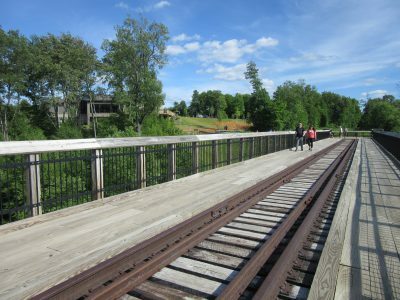 Maybe the next time through, on our return trip from Vermont, I’ll be able to get some photos. It was a day spent in great beauty, but we wasted quite a bit of time due to lack of preparation on our part and lack of signage on the part of the park. I should have packed snacks. Normally, we at least have some trail mix and water, and in the future, I’ll do better about having snacks, especially on outings to areas that are sparsely populated. All in all, it still was a trip worth making.